“Disney Dorks” What makes up the Disney Community? – Travel, Family & Fun rolled into one! Websites, blogs, vlogs and podcasts bring people together in all sorts of ways via travel, dating, food, and most importantly friendship. I can truly say that there is no better relationship than a Disney friendship. Disney fanatics come from all walks of life: Waitresses, Attorneys, Teachers and even Stay-at-home moms, like me. At minimum you had one common interest~ the icon, the main mouse, the radical rodent himself~ Mickey Mouse and all of his domain! You probably formed your magical friendship because in some way, shape or form you like, love or loathe Disney. Then you bonded because of your common interest in all that is Disney: Walter E. Disney, history, movies, trivia, etc. I can’t pinpoint it exactly, but there’s something about Disney magic that takes on a life of its own. It entangles you in this charming spirit, even when you can’t be there in person. Being a part of this community is almost a way of being at the parks mentally, when you physically cannot. There is never a shortage of Disney BFF’s visiting and if you’re anything like me, you live vicariously through them on vacay, sick I know. Woot! You can totally be yourself with Disney dorks, who else can you have full conversations using only acronyms and initialisms, “Like Yoda, speak” or wear Mickey ears while having an intelligent conversation. Whom else, as full-grown adults can light saber down Main Street whilst eating a Mickey bar (don’t lie; you were picturing this in your head, lol)? A Disney buddy that’s who… A Disney dork might have a few obsessions, oh I mean’t collections. Some enjoy collecting dish towels with an obscenely large Mickey handprint, Mickey ears or even Disney Dooney & Bourkes. Ahem……The collections range anywhere from cute and cuddly to cuckoo for crazy puffs. TIP- stay clear of the latter…. What makes Disney fantastical and keeps peeps coming back for more? For some, it could be memories from childhood at a Disney Park, its ever-evolving blueprint or the impression of stepping into a different time, place or Fantasyland. There are so many words I want to convey about this fairytale come to life, but only one emotion comes to mind~ FEELING. The feeling of Disney encapsulates my sense of touch, smell, sight and sound, it’s a sensory overload of the magical kind. Being at Disney, on a Disney blog or talking to a Disney buddy feels like you’re under a slaphappy spell. Disney has figured out a potent concoction that unites all who come to this happy place. I think a lot has to do with Disney’s innovative Imagineering and storytelling capabilities. The carefree feeling of being a kid again is definitely a big part of everything Disney. 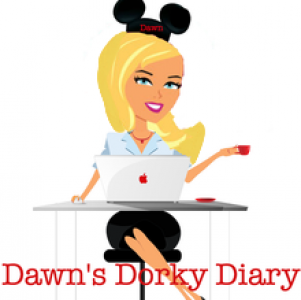 I have made lifelong friendships with dozens of “dorks” from the Disney community and they all share one quality that I haven’t found anywhere else. They seem to behold the “feeling” I get from Disney eternally, they exude happiness more than not. Let’s be honest, that’s hard to come by these days. If you can be around happy, uplifting, fun lovin’ peeps; please do so, its merriment for your soul! With great pride, I wear my Disney dork badge! Next Post “Disney” Giveaway ~ Hooray! I love this!! You are one of the best Disney Dorks I have met. So much of this says exactly how many of us feel. Disney friendships are some of the best friendships there are!